A thick, strong polyethylene tape used mainly for Poly Film splicing & sealing, or pipe insulation. A polypropylene film with an acrylic cold weather adhesive. UL printed. Meets all state building codes requiring UL181-FX. 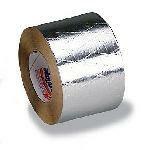 This silver grey duct tape is cloth backed 91/2 mil with high quick adhesion. Waterproof. 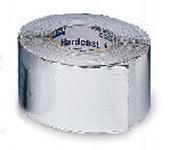 Excellent for insulation, batt sealing, hose wrapping and other general purposes. Also available in red for easy sight on outlets or other cover ups during wall spray. 2" x 60 yds. 10 1/2 mil tape is foil and fiberglass, scrim laminate designed for sealing scrim faced duct insulation. Used where extra strength beyond regular foil tape is needed. These house wrap tapes provide seal against air and moisture when used on seams and other openings in house wraps. Tridirectionally reinforced U.L. listed white polypropylene/scrim/kraft lamination. Quick stick in all weather conditions. This duct tape is cloth backed 91/2 mil with high quick adhesion. Waterproof. Excellent for insulation, batt sealing, hose wrapping and other general purposes. Also available in red for easy sight on outlets or other cover ups during wall spray. 2" x 60 yds. ULclassified 2 mil with high tack adhesive. Superior conformability for sealing insulation and foil-faced sheathing.